Commemorative Benches are beautiful ways to pay tribute to loved ones that have passed. Each bench is available with full custom options including: portraits, inscriptions, and sceneries. Our benches are designed to withstand harsh, outdoor weather conditions, to last for years and years. We also offer a variety of powder coating colors that you can view here. 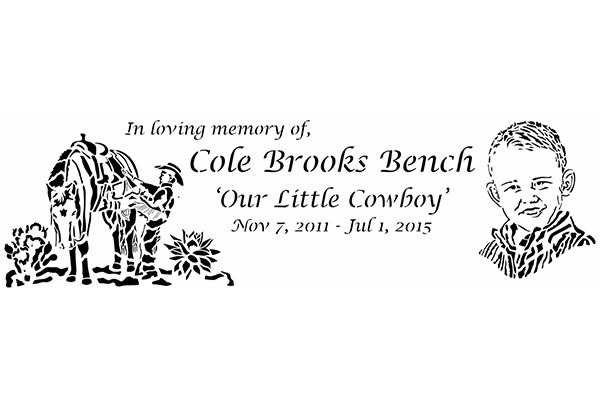 To get started on your commemorative bench, give us a call at (801) 414-1724. No two people are the same, so their bench shouldn’t be either. This is why our designers will work with you one-on-one to create a custom bench that helps represent your loved one. Keep scrolling to learn more about the process. 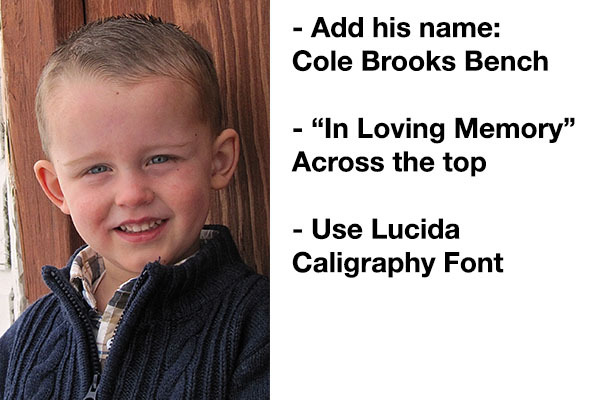 To get started, be sure to send us any ideas you have for the memorial bench. This can be in the form of photos, poems, sceneries, important places, etc. Once we have received your design ideas, we get right to work creating the bench design. Our designers excel at capturing your loved one’s features into the bench detailing. Once you have approved the bench design, it is sent to be laser cut. Our team will then weld the bench together, powder coat to the color of your choice, and then ship the bench to you. Why Choose A Commemorative Bench? The first commemorative bench we created was for one of our own family member’s that had suddenly died. We realized how healing that process was for us, and wanted other people to have the chance of that same therapeutic experience. We have also been told by others that the bench has become a place of remembrance and love. To keep the metal benches looking new year after year, each bench is sandblasted, primed, and powder coated. This process provides a durable finish on the metal that is resistant to chips and scratches. The color will also stay lustrous and shiny, even with excessive sun exposure. You can learn more about it here. The bench is laser cut from a single sheet of metal. It is then bent into the bench shape. This process requires less welds; yielding a stronger, more durable bench. We use stainless steel footpads on the bench that prevent rust from going up legs.